GFSK Long Range Half Duplex RF Transceiver Module.TRW-24C is high frequency 2.4GHz transceiver module.The longest range is up to 800M. 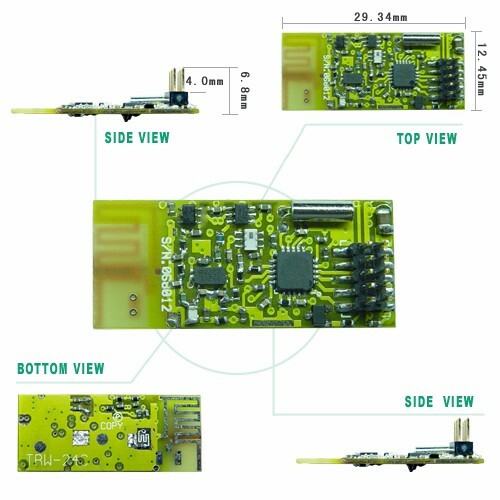 RF Digital design, through MCU, SPI communication form, it is easy to plan. The RF transceiver is integrated with a highly configurable baseband modem. The modem supports various modulation formats and has a configurable data rate up to 250 kbps. The communication range can be increased by enabling a Forward Error Correction option, which is integrated in the modem. TRW-24C provides extensive hardware support for packet handling, data buffering, burst transmissions, clear channel assessment, link quality indication and wake-on-radio. The main operating parameters and the 64bytes transmit/receive FIFOs of TRW-24C can be controlled via an SPI interface. In a typical system, the TRW-24C will be used together with a microcontroller and a few additional passive components. Separate 64bytes RX and TX data FIFOs. Efficient SPI interface: All registers can be programmed with one "burst" transfer. Programmable output power up to +19dBm. High sensitivity (-106dBm at 10kbps, 1% packet error rate).